Nine conservation authorities across the Oak Ridges Moraine (ORM) joined together in 2000 as the Conservation Authorities Moraine Coalition (CAMC) to advocate for and protect the moraine along its 160-kilometre length. The CAMC was formed in response to the need for a comprehensive policy, planning and management approach geared to sustaining the health of the entire Oak Ridges Moraine. 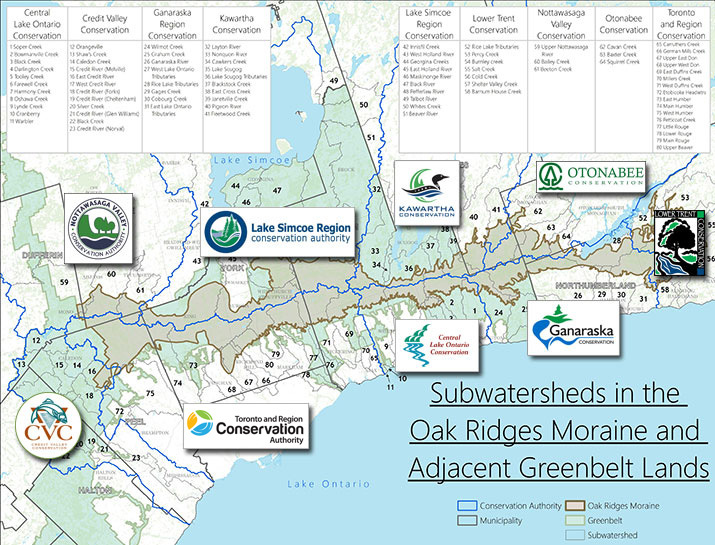 The watershed boundaries of the nine independent conservation authorities – CENTRAL LAKE ONTARIO, CREDIT VALLEY, GANARASKA, KAWARTHA, LAKE SIMCOE REGION, LOWER TRENT, NOTTAWASAGA VALLEY, OTONABEE, TORONTO AND REGION – collectively cover the entire moraine. Together, as of 2012, the conservation authorities own more than 14,000 hectares of public lands on the Moraine. This makes them responsible for the management of the largest and most strategically located tracts of land protecting the headwaters of the 65 river systems originating on the Moraine. These lands include both environmentally significant and publicly accessible recreational lands such as the Ganaraska Forest Centre, Fleetwood Creek Natural Area and Purple Woods, Thornton Bales and Albion Hills conservation parks. The CAMC is a partnership organization, collaborating with numerous groups and individuals to achieve our common objectives for healthy headwaters, education and sustainable living on the Oak Ridges Moraine. The activities of the CAMC and links to some of our partnership projects are shown below. The Report Card reveals that efforts to protect the Oak Ridges Moraine (ORM) have been successful in safeguarding existing forests, aquatic habitat, and groundwater the region’s residents rely on. However, the report also identifies that further work is vital to ensure the preservation of this significant natural heritage landscape. Visit the Conservation Authorities Moraine Coalition website for more details. Providing coordinated and effective scientific expertise in the undertaking of watershed plans and watershed stewardship services as well as our traditional role of providing environmental planning advisory services to municipalities (see Links above).